The RYA Essential Navigation and Seamanship Course is a basic introduction to navigation, seamanship and safety. It’s a great course for all those who are new to sailing or motorboating or for new skippers wanting to refresh their knowledge. The classroom course is the best option for all those who enjoy learning in a more social and interactive environment. 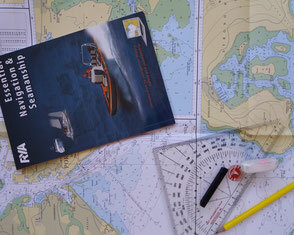 The course aims to introduce the basic concepts of inshore navigation and safety in an easy and enjoyable format. Over the two days duration, you will be introduced to the basics of navigation including tidal awareness, charts, almanacs and the use of electronic navigation aids such as GPS. You will be taught about harbour entry and departure pilotage including knowledge of buoyage and a thorough understanding of the Collision Regulations so you know who has right of way! Time will also be spent looking at sources of weather information and what impact this could have on your passage. You will also learn more about what safety equipment you should carry and how it is used. You can book directly online by first choosing your preferred dates below and then clicking the 'Add to cart' button. If you prefer, you can also give us a call or send us an email with your desired dates and we will get back to you with a confirmation. Once you book the course, we will send you the course pack (containing the RYA Handbook, RYA training charts and almanac, Breton plotter, dividers) so you can start browsing through. We will also send you the detailed joining instructions. Please select here below your course date! !